2 How to Download NRC Claim, Objection & Name Correction form Online? Dear All Applicant of NRC, If you have any objection against any ineligible entry in Draft NRC, any error in spelling and want to Name Correction before publishing Final NRC then this article is especially for you. Here in this article, I am going to discuss all information related NRC Assam Claim, Objection & Name Correction. 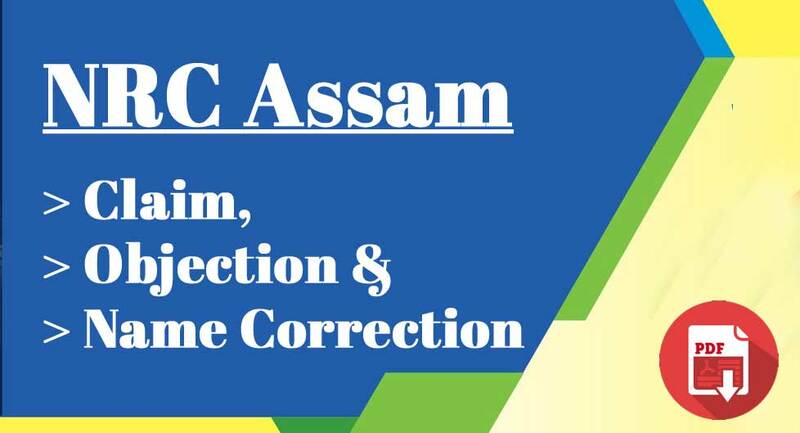 There are separate forms for Claim, Objection, and Correction, available in 3 different languages English, Bengali & Assamese, to download in PDF format online from NRC Assam official website www.nrcassam.nic.in. The forms are also available at your nearest NRC Seva Kendras. How to Download NRC Claim, Objection & Name Correction form Online? Form for this application is available at the NSK and also available for download online at www.nrcassam.nic.in. Claim and Objections can be submitted from 30th August 2018 to 15th December 2018. Forms for Claim, Objection or Correction is made available at the NSKs and available for download from www.nrcassam.nic.in from 7th August 2018 onwards. Follow below steps to Download Forms from NRC Assam Official website. 4] Here in this page, You will get all the Forms in the different language. Just Click on the form which you want to download and it will start downloading instantly. If you are facing any issue in downloading those forms then you can also use direct link to Download. An application is required to be submitted to the LRCR at the designated NSK asking for non-inclusion of name(s) in the Complete Draft NRC. This process has started from 7th August 2018 to 15th December 2018. NRC Correction Form – The Application can be submitted by the applicants published in the updated draft NRC for the correction of names, age, address, etc. NRC Claim Form – This form can be submitted by only those applicants who submitted their NRC Application form until 31st August 2015. NRC Objection Form – The application can be submitted to any person who has noticed any ineligible person included in the Complete Draft NRC. Applicants who do not find their names in the Complete Draft NRC should not be worried or have any apprehensions. THIS IS NOT THE FINAL NRC. Such applicants will get another chance to submit their Claims for inclusion of their names in the Final NRC. There will also be provision to submit Objection against any ineligible entry in Complete Draft NRC. Corrections can also be made in any errors in spellings of names, age, addresses details etc. An application will be required to be submitted to the LRCR at the designated NSK asking for making available the reason of non-inclusion of name(s) in the Complete Draft NRC.